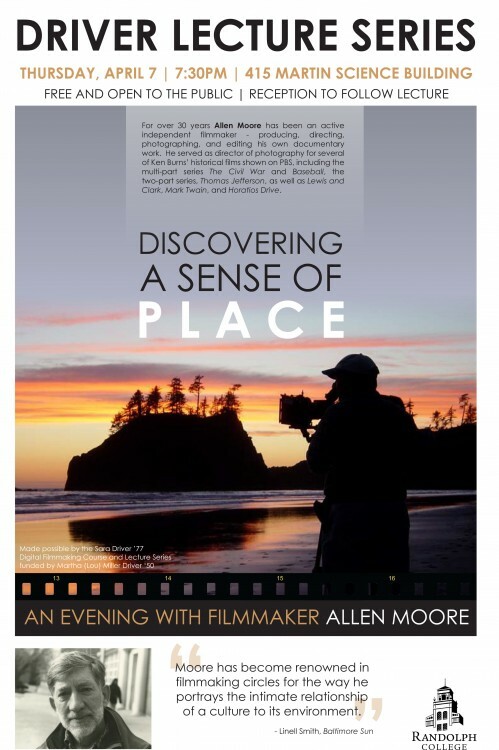 Independent filmmaker Allen Moore will share his personal experiences as a cinematographer and give advice to Randolph students about how to enter the film industry for the Spring 2016 Sara Driver ’77 Lecture. The program is free and open to the public, and will take place April 7 at 7:30 p.m. in Room 415 of Martin Science Building. Moore is an active independent filmmaker who has produced, directed, photographed, and edited his own documentaries for more than 30 years. He served as director of photography for several of Ken Burns’ historical films that aired on PBS, including the multipart series The Civil War and Baseball, the two-part series Thomas Jefferson, as well as Lewis and Clark, Mark Twain, and Horatio’s Drive. He is a faculty member at the Maryland Institute College of Art, and is currently enrolled in a residency program at the Virginia Center for the Creative Arts. Communication studies professor Jennifer Gauthier is excited that Moore has agreed to take time out of his residency and share his expertise with Randolph students. The Driver Lecture is made possible by Sara Driver ’77 and the Digital Filmmaking Course and Lecture Series, funded by her mother, Martha (Lou) Miller Driver ’50. Each semester, the series brings a professional from the film or media industry to campus to work with students and deliver a public lecture. For more information about Randolph College’s communication studies program, please visit https://www.randolphcollege.edu/communicationstudies/.